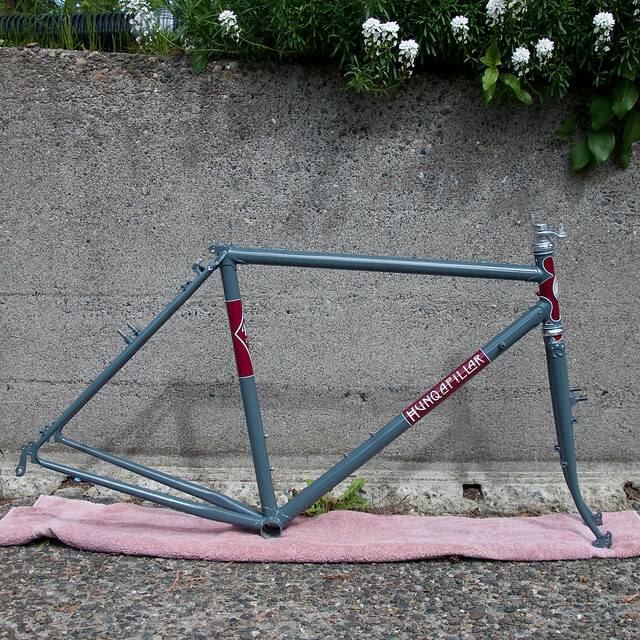 It was time for a new bike for 2012. This one is for the mountains! It’s a wooly mammoth bike! 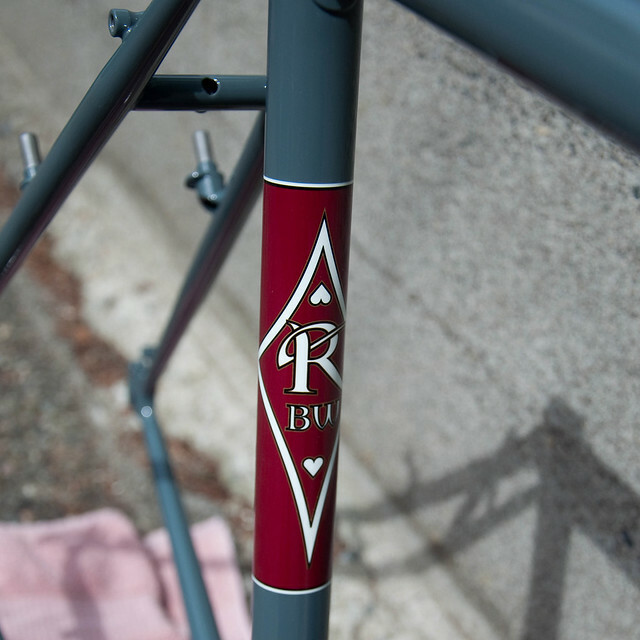 I rode one last summer at Rivendell World HQ and was smitten. 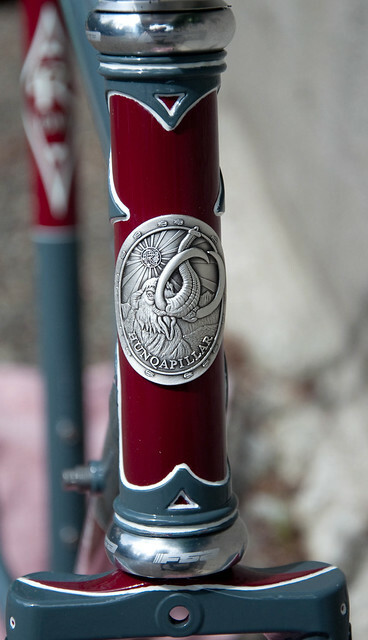 I just love Rivendell bikes. Their design and execution is unlike any other, and Grant runs a great business. I decided to snarf up a Rivendell Hunqapillar. 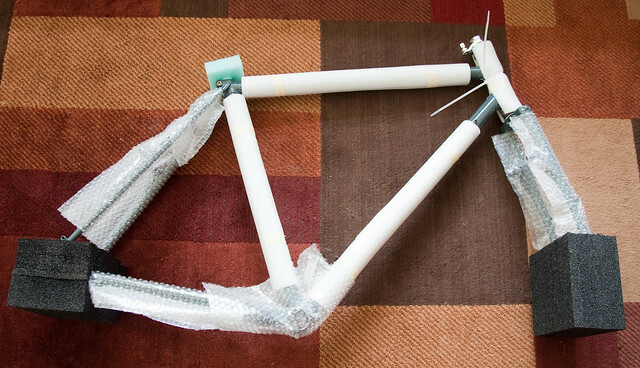 It’s a 54cm frame, and will be set up as a mountain/camping/commuting bike with a front rack, fenders, and lights (like any proper bike for the NW). This was in the original color scheme that is being discontinued. 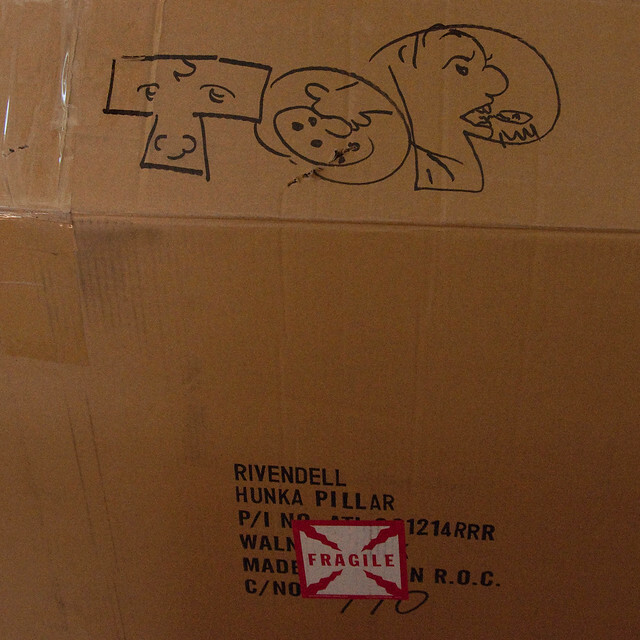 The Rivendell folks are well known for their expertise in packing a bike – they even add doodle art to the packages – great personalized funk! Here it is all uncloaked. I love the color scheme on this model. There is something about the kidney bean and gray combination that really classes out. I felt lucky getting one of the last of the original runs. 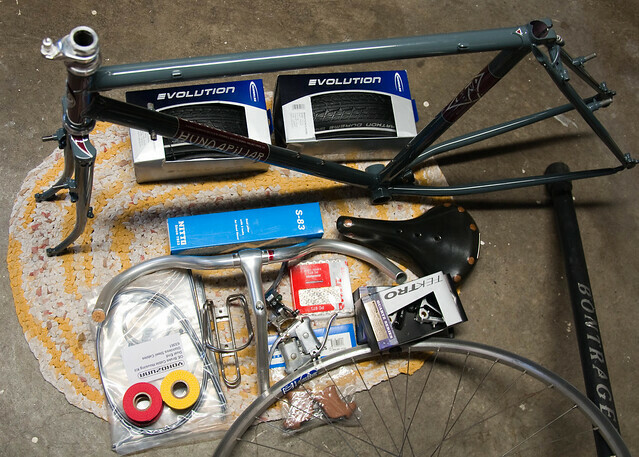 The build out will be a moustache cockpit, brooks saddle, and marathon dureme tires (700×50). 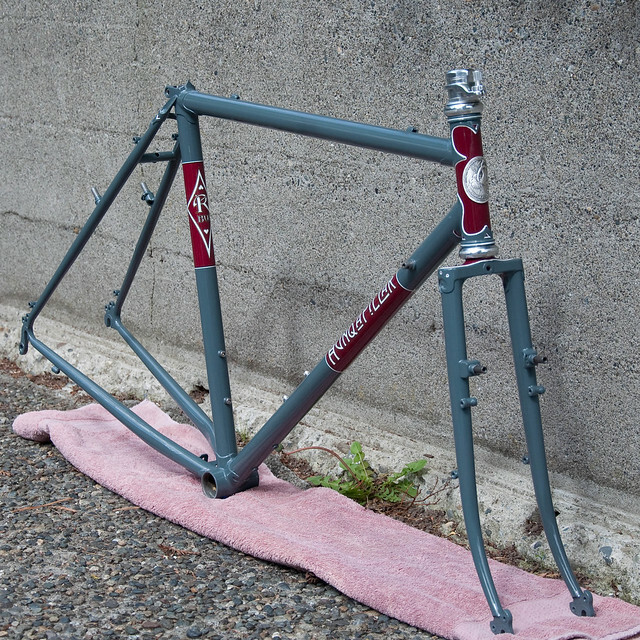 This will be a working bike, and I want to take it anywhere. I also want to be comfortable on the bumps. I’m adding a custom rack made by a local builder “Haulin’ Colin” Stevens. This was originally designed and made for the Rawland rSogn, but I saw it on his site modeled on a Hunqapillar that a friend had lent him, and the image stuck. 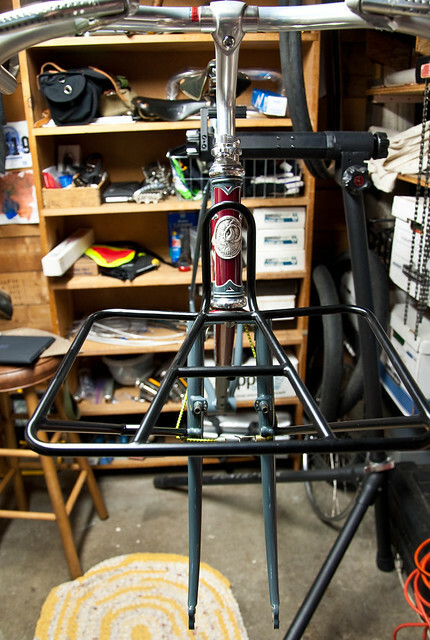 The rack fits the bike perfectly. 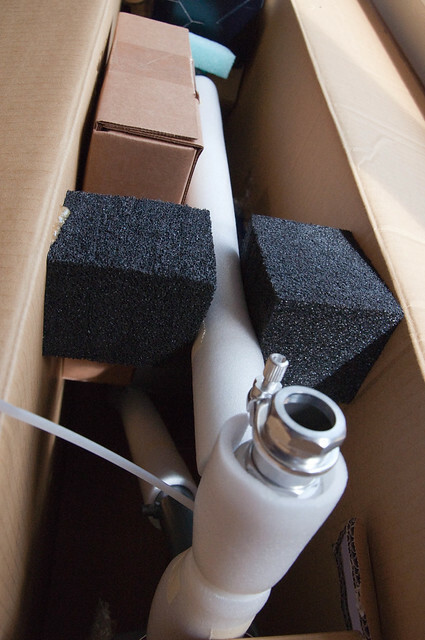 I have a few more parts to get or scavenge before this one is ready, but I’m anticipating a great new ride. The frame and fork with headset weighed in the neighborhood of 7 lbs on my Wii scale (accurate??). This is a stout tube bike, but it felt surprisingly light. I recalled it being much lighter than I expected on the test ride, as well. 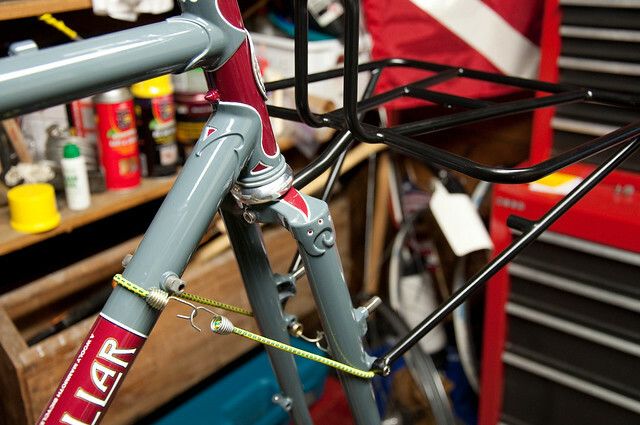 This model is a more robust touring bike than the well-loved Atlantis, and has similar gauge tubing to the Bombadil. I can’t wait to do some exploring this summer!